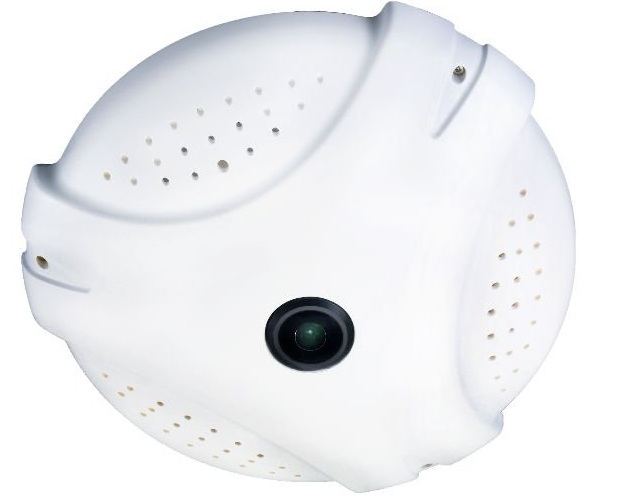 Low-cost IP camera provider Pixord has released two panoramic models targeting much lower price points than competitors, along with potentially simpler integration. However, Pixord has not been clear about what drawbacks might exist. In this update, we examine Pixord models and their limitations, contrasting with competitors in the panoramic camera space such as Mobotix, Vivotek and ImmerVision. The Pixord panoramic line consists of the PD636 and the PD637 domes, indoor and outdoor, respectively. These cameras are day/night with a mechanical cut filter and a two megapixel sensor. Five megapixel versions are in development. An earlier model, the PD630, is also available, but is VGA only. The standout feature of the PD cameras is that dewarping is done on the camera, so no software needs to be installed. Users may view dewarped video directly in the camera's web interface. Video may be viewed in multiple configurations, such as a quad screen of dewarped views, a panoramic overview plus two dewarped view, and more. Pixord reports that this method leads to less API work necessary to integrate this series of cameras with various VMS offerings. However, there are substantial drawbacks to Pixord's dewarping implementation. While a handful of VMSs, such as Milestone, Digifort, Luxriot, and others, list the camera as supported, the integration is basic. Essentially, the VMS sees whatever is set up in the camera's web interface. So in a single XProtect tile, for instance, a user may see any of the above views (quad, pano + 2, etc. ), at a maximum total resolution of 2MP for the entire image. Each view in a quad screen layout, for example, would be SVGA (800x600). Additionally, no virtual PTZ controls are offered through the VMS, so views may not be changed from the client software. In order to set up a different view, the user must once again go to the camera's web interface. This is a serious limitation, as the number one claimed benefit of panoramic cameras is often the ability to view and record the entire scene, but zoom in on regions of interest as needed. In Pixord's case, the 2MP quad or other view will be recorded by the VMS, with no ability to change views on archived video. There are some differences in these cameras. First, both the Mobotix and Vivotek cameras are 3MP, instead of the 2MP Pixord. The Q24 is not day/night and available in color or monochrome only. Finally, both the Vivotek and Mobotix cameras are rated for outdoor use. The PD637 is an outdoor, IP66-rated Pixord model, but pricing was unavailable, as it is a new model. We suspect that the outdoor Pixord model would close the pricing gap somewhat, but still come in less expensive than competitive models. The whole scene may be captured but that will be warped unlike competitors where a dewarped view can be generated dynamically. Alternatively, a set view of different areas can be set. However, you are constrained to only those areas unlike Pixord's competitors where the whole area can be captured and the views can be dynamically changed after the fact. Pixord's integration / display approach makes it little more than a fixed camera with greater flexibility in selecting digital zooms/display. It might be half the price but if you are looking for a full panoramic solution, this is not it.